The Clemson Tigers finished the 2018 season by making history in the CFP National Championship, defeating the Alabama Crimson Tide 44-16 for their second national championship in three years. The team was flawless throughout the season, so it should come as no surprise that many of the stars of the 2018 Clemson Tigers are set to be taken in the early rounds of the 2019 NFL Draft. The Clemson Tigers demolishing the Alabama Crimson Tide in the CFP National Championship game only hints at the incredible season that the team enjoyed. The championship game was contested by two 14-0 teams, meaning that one was going to make history, but it was Clemson which landed the first 15-0 season of major-college teams since Penn in 1897. Following such a historic season, many Clemson Tigers players are in line to be taken at lofty slots in the upcoming draft. The team will almost certainly lose a good chunk of their championship-winning team, and yet despite this, Clemson are still the +175 favourites in the American football odds to win the NCAAF Championship next season, ahead of the near-perfect Alabama at +220. Last season, despite having another strong season, the Clemson Tigers saw only three of their players selected in the 2018 NFL Draft, with only one going in the first two days – Dorian O’Daniel in the third round. A further four were picked up as undrafted free agents. This season, however, it is expected that plenty of Tigers will go early. After celebrating their national title victory, Clemson Tigers Dexter Lawrence, Trayvon Mullen, and Tre Lamar opted to forgo their senior years to make themselves available for selection in the 2019 NFL Draft. 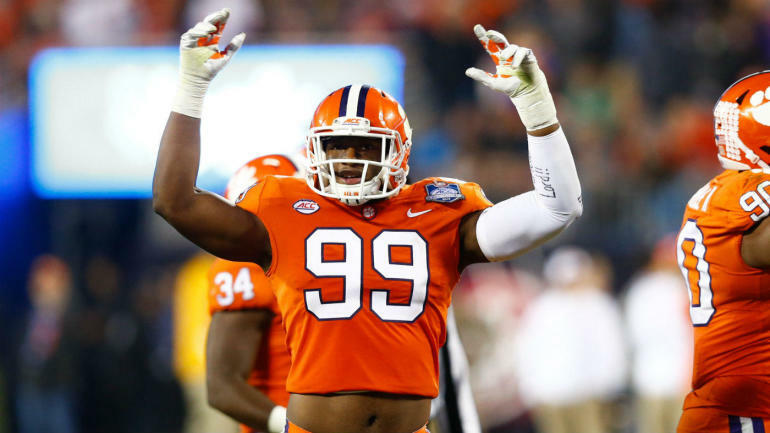 This news added the defensive tackle, cornerback, and linebacker to the top set of Clelin Ferrell, Christian Wilkins, and Austin Bryant who are all expected to go in the first couple of days of the draft. Of the six, Clelin Ferrell is expected to be taken the highest, potentially going as a top-ten pick. The edge rusher could have been a very lofty selection last year if he had declared and should still demand an early pick, depending on how teams fill needs in the free agency. Next on the list is defensive tackle Christian Wilkins, who was an almighty force in the national championship game and has great character, so should be taken in the first round as well. Fellow defensive tackle Dexter Lawrence could also see their name come off of the board in the first round. Tre Lamar has struggled with injuries in the past but boasts a great deal of upside, which could see him taken in the second round. Teams looking for a strong pass rusher in the third round will be targeting Austin Bryant, which could be a steal, as could Trayvon Mullen if he falls to the third round. He has top-class talent, but people are worried that he didn’t show off his skills enough in 2018 to warrant a pick in the first couple of rounds. Along with these six Tigers, there are murmurs that offensive tackle Mitch Hyatt could also be picked up in the first few rounds. Clemson is set to have a very strong showing in the 2019 NFL Draft, more than making up for a distinctly meek 2018 draft.